What thought first comes to mind when you are told, “Write a poem for the next class” or “Here is a poem analysis essay assignment. It is due in a week”? If your response is, “Oh, God. Why?” then welcome to the club. Thousands of students just like you struggle with poetry writing, which is why they buy poems online. 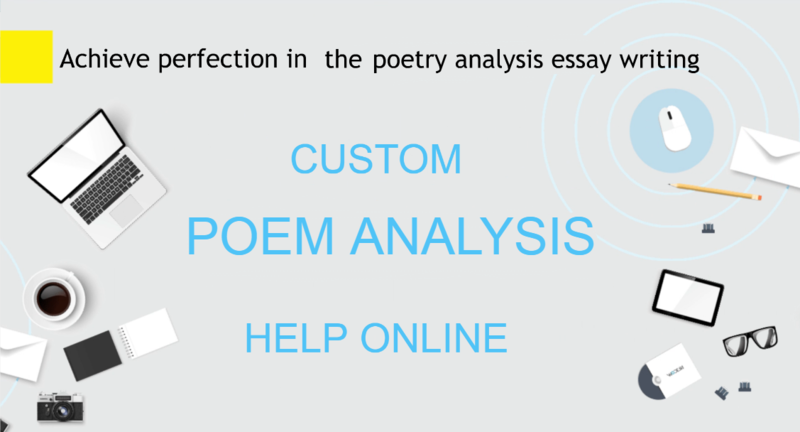 Few understand how to write a poem analysis essay either, but our custom poetry writing service and affordable help with poetry analysis are here to help. When you order a poem analysis essay or buy a poem, we will put you in touch with an expert writer who has extensive background in writing and analyzing poetry. Poetry is a form of expression that demonstrates love and passion, and even inspiration or nostalgia. Poetry writing requires both strong writing skills and the ability to organize your thoughts and emotions into logical rhymes. Poetry is not something that can be taught, it comes from within. As a result, a person essentially must be born with the ability to do it correctly. Poetry tells a story, but not in the same way as prose, which is far easier to construct. A narrative involves such elements as characters, plot, theme, setting, and conflict. On the other hand, with poetry you must be a real wordsmith, understanding how to weave figures of speech with ambiguous expressions that can take on many different interpretations. Of course, when you are critiquing a poem, you have to put yourself into the mind of the author and understand their intentions. In most cases you must also do research in order to gain context. Once you have been assigned a poem analysis essay, it is important that you avoid procrastinating because this type of assignment involves several steps, including outside research on the author, genre, type of poetry, and even contemporary insights that would explain the motivations behind the work. Choose the poem. Sometimes a professor will assign specific poetry from the course readings, but in other cases, you are free to choose your own poem to analyze as long as it meets the assignment criteria. For instance, you might be asked to limit your choice to a specific genre, period or author. If you have a chance to pick one on your own, use it to your advantage and opt for something that interests you since you will be more motivated. Do the research. Who would have guessed that a poetry class would involve doing research! If you are being asked to critique a poem, it is an absolute must. You need to understand the biography of the author, particularly the crucial events in their life that inspired them or even created emotional trauma. Check your instructor’s guidelines. Your assignment might require you to address very specific aspects of the poetry, so you neither want to overlook them nor do you want to take an approach that runs counter to the instructions. Choose what to analyze. When analyzing the poem, you will need to decide which parts of the poem should be evaluated and determine how to do it. Make an outline and write the paper. The outline serves as the blueprint for the entire essay, and creating it will make the writing process so much easier. Like will most standard essays, your critique should contain an introduction, body paragraphs, and conclusion. The introduction will inform the reader about the title of the poem and author’s name. You should also provide some background information so that the reader understands why you took your approach to analyzing it. You will finish the intro with a thesis statement. In the body paragraphs, you will choose three main points to support your thesis statement. Finally, you will end the paper with a conclusion that discusses how your critique of this particular poem fits into the broader picture. You can look at poem analysis essay examples in order to get a better idea about how to organize the paper, but do not actually choose one that critiques the same poem since you want to be able to generate your own ideas without being influenced by other essay writers’ opinions. If you feel confident in your abilities to write a poem or critique the poetry of others, we are rooting for you to succeed. However, if you lack the required writing skills or simply do not have the time, we would suggest seeking poem writing help or poetry critique essay assistance. You can buy poetry online that is customized to suit your needs. We also offer poetry critiquing services that can get you the high grades that you need. Our expert writers have extensive experience with writing and analyzing poems. In fact, you can even request a free poem analysis essay sample written by our writers and choose the expert who you think will do the best job. Once you place your order and make a secure payment, you will have full access to your assigned writer! Feel free to write them with any questions or to just check up on the progress of your order. Every paper is run through our plagiarism detection tool to ensure its uniqueness. We also have a quality assurance team that edits and proofreads every poem or poetry critique essay so that it looks its best before delivering it to you. We want to see you succeed academically and beyond. It all starts by buying an affordable, custom-made academic paper through our poem writing services. Forget about turning in a poem analysis essay example that you have downloaded off the Internet and choose a professional to write something that truly reflects your paper instructions. Once you make your first purchase, we are confident that you will come back again and again for additional essay orders. Our customer support team is available around the clock to help you place your order or ensure a smooth process from start to finish. Your partnership with PrimeDissertations.com will lead to higher grades and a whole lot less stress. So order today!